Scientists have found that ‘Oumuamua, the interstellar object that was found passing through our Solar System in October, may not be what it appears.It had been thought this object was an asteroid from another planetary system because we hadn’t found a coma of dust and gas around it – something that icy comets have as they melt or sublimate. The latest observations of ‘Oumuamua, however, published in Nature Astronomy, show that the object has an organic-rich layer on its surface. The research suggests that this could have protected a hidden ice-rich interior from being vaporized during its close passage to our Sun. Spectra here refers to measuring the light from the object, and seeing what elements it is made of. In this case, it seems to have a layer of carbon on its surface – an “organic coat” if you will. Organic basically refers to the presence of carbon. 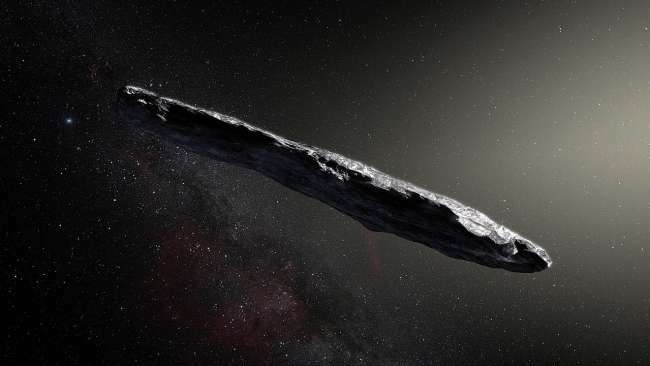 ‘Oumuamua passed within 0.25 AU (astronomical units) of the Sun, a quarter of Earth’s orbit, before making its way out of our Solar System again. At this close proximity, if it had been a comet we would have expected to see signs of its ice sublimating (turning from solid to gas). That wasn’t the case, however, which is why we thought it had been an asteroid and thus devoid of ice. But this latest study suggests it could well have been icy, which changes how it might have formed in the unknown planetary system it originated from. The object remains very unusual, with a lot of questions still unanswered. We don’t know where it came from, for example, nor do we know how old it is although an upper limit of 10 billion years has been suggested. It may be possible to see cometary activity as it makes its way out of the Solar System. Scientists hope to discover more interstellar objects like this one in the future. Finding out what they are made of, and whether they are icy or not, could tell us more about how other planetary systems form.